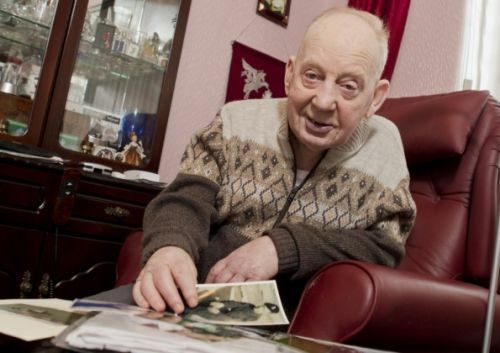 A Belfast man who forged a birth certificate to fight in World War Two is making an emotional journey to commemorate the D-Day landings. Bill McConnell was only 17 and living in Ballyclare when he volunteered for service with the Royal Ulster Rifles. The ageing veteran, now 88, first travelled to Normandy for the 50th anniversary of the landings and is one of the few still able to make the journey. He was saddened to discover in 1994 that no permanent memorial to his fallen comrades was ever erected and decided to raise the funds to establish one. Thanks to Bill’s efforts, a lasting tribute now stands at the Lougueval and Swords beaches in honour of the 6th Airborne Division with which he went on to serve with distinction. Having signed up in 1941, he eventually joined a glider assault squadron ahead of Operation Overlord and crash landed on D-Day (June 6, 1944) around 35 miles behind enemy lines – directly in the firing line of a crack SS Panzer unit. His detachment suffered heavy casualties but managed to hold the Panzer unit’s advance and eventually forced its withdrawal. Since his 1994 visit, Bill has become a regular visitor to the beaches and battlefields where so many of his generation made the ultimate sacrifice. “We were the only regiment in the British Army who sent two battalions in on D-Day and I thought it was a great shame that there was nothing to remember those who sacrificed their lives,” he said. Bill’s war had been relatively uneventful until D-Day but he faced almost constant danger until the war’s end. March 1945 was particularly perilous for Bill’s unit and the young corporal suffered shrapnel wounds during the Rhine landings in western Germany. “Ninety per cent of our gliders were shot down. We had been told there would be no resistance, but the Germans were using anti-aircraft guns and we were in plywood gliders with cellophane windows and nothing to protect us. Bill is making this week’s trip with the help of a grant from the Big Lottery Fund’s Heroes Return 2 programme. • The scheme pledges funding for veterans, spouses, widows and carers from either side of the Irish border wishing to mark official commemorations. Further information is available at www.biglotteryfund.org.uk or by calling 0845 00 00 121. This page was loaded Apr 25th 2019, 10:04 pm GMT.